Joining Kids and Horses is about working together to enrich each other’s lives. Discover a community in Northern Nevada, focused on enriching the lives of families and individuals with special needs. Kids & Horses serves individuals facing a broad range of challenges including paralysis, multiple sclerosis, autism, muscular dystrophy, Downs syndrome, cerebral palsy, traumatic brain injury, stroke, learning disabilities and emotional issues. Anyone who can benefit is eligible for inclusion in the program. Equine-assisted therapeutic riding has proven healing benefits. These include increased strength and flexibility, improved motor skills, speech promotion, memory and cognitive reasoning, relationship building and social skills. Kids & Horses offers one-on-one individually tailored riding lessons to improve strength, coordination and self-esteem of students. There are currently forty-five adaptive riding students at the ranch and approximately fifty percent are on scholarship. No student has ever been turned away from the program due to a lack of means. There are also twenty-seven hippotherapy clients currently being served at the ranch in either occupational therapy or physical therapy. 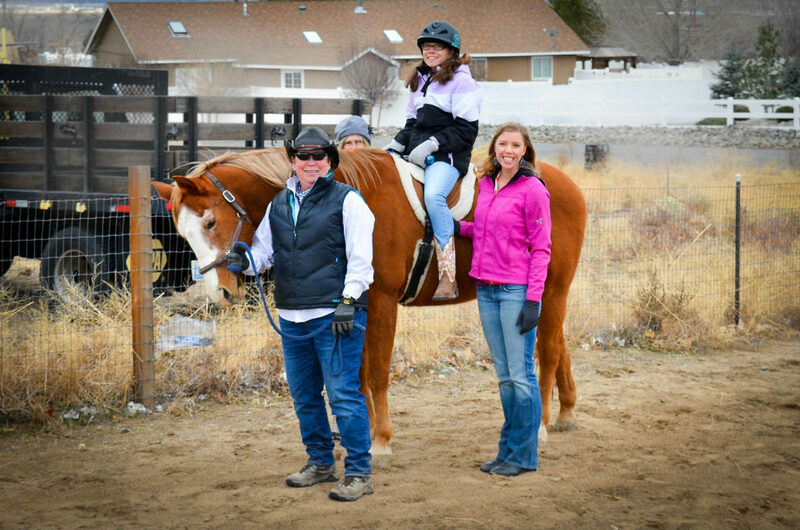 If you or a loved one is interested in becoming a student or client at Kids & Horses, please fill out the prospective client form (click to download) and fax (775-267-2349) or email (info@kidsandhorses.org) our center and we will contact you about our services. You can also call our office on Tuesdays, Wednesdays, or Thursdays (775-267-1775) to discuss our services in more detail with our program director.